I keep wonder what an inauthentic sweat stain would look like. There is a lot to think about. And I liked hearing the viewpoint of the shop where you work. I wish there were more like it! There is no excuse for charging exorbitant prices for such severely damaged garments. The only people who purchase these garments are costume designers for theatre or film who wish to produce an authentic feature. You might consider looking for a pattern or hire a talented seamstress to sew one for you from a picture or photo! It would be an easy dress to make, but I’m wanting an old one. Not to wear, and I can tolerate a small bit of damage, but that that dress at that price. “You can’t buy good taste”?! You can buy old sweat? Who ever implemented the wear and tear factor when evaluating old anything has always been a puzzle / if not weird to me. Perhaps some collectors feel excrement of all sorts adds value? If – it’s provenance is significantly historic? 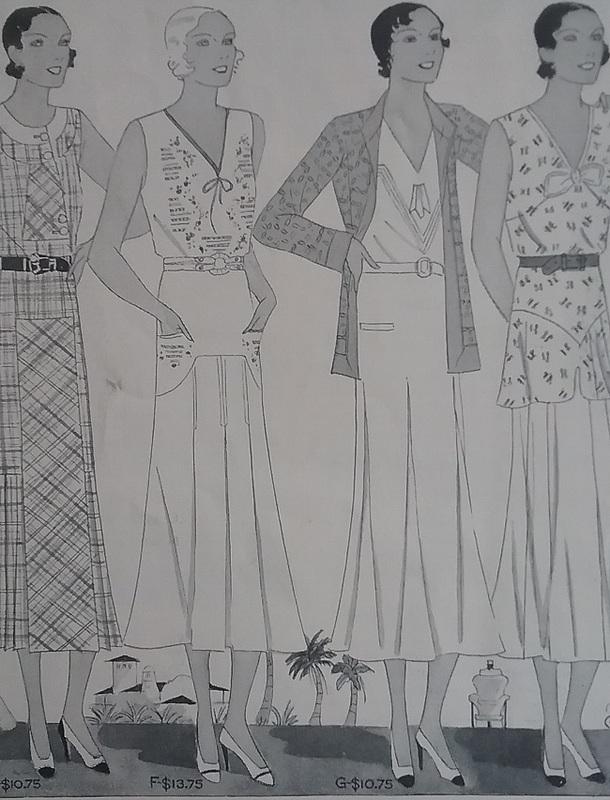 I prefer the B Altman catalog for the wonderful fashion illustration. I loved that old store. Talk about fashion history. B. Altman catalogs from the late 1920s and 1930s are the best ever! I have a few things that have stains (not excrement, mind you!) that I don’t mind, like a circa 1916 hiking skirt, and a pair of 1940s work overalls. In these cases the stains show a past life of the object being used, but I draw the line at things that are just nasty. I would be embarrassed to sell something pre-owned or vintage that wasn’t in wearable (or display-able) shape. Yes, and I can’t help but think that some vintage laundry whiz could actually make this dress wearable. Still, not at that price! On second thought: I guess the other audience for pieces like these (other than tue-blue vintage fashion-lovers and collectors) are designers and design teams who buy vintage for inspiration. So sweat stains wouldn’t matter to them. Just the silhouette etc. To me, condition is relative depending on rarity. Stains and holes might not be such a big deal in a really rare piece, but this is an early 1930s dress that is really quite common. It’s an absolutely ridiculous price for a dress no matter how old! Well, maybe it it were an 1880s sporting dress with no damage and an excellent label and some provenance. I’m sorry, I meant to leave a comment, but I can’t stop laughing. Good luck with your search. I could probably guess where you were hunting when you found that “authentic sweat.” I avoid the place like the plague, as it makes me angry, and who needs that? 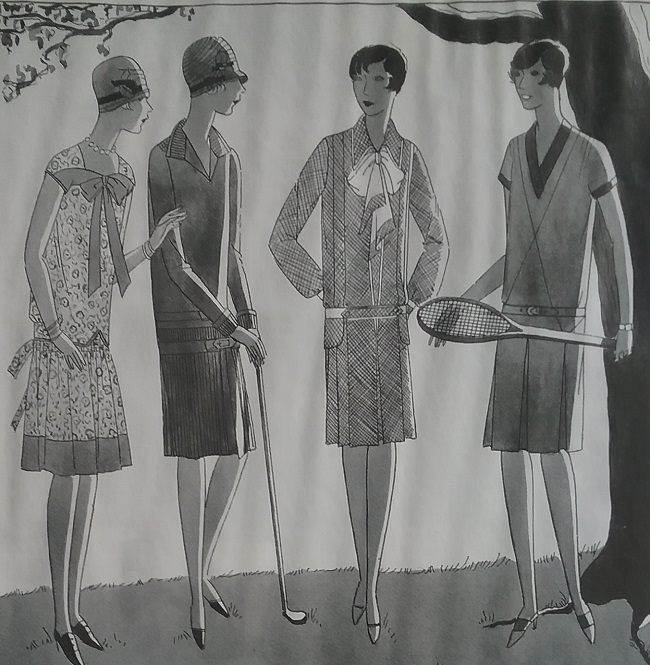 I will add your tennis dress to the ever-growing list of stuff I keep an eye out for on your behalf. In other news, I really wish I could say these yoga pants and exercise top were “30s beach pajamas” and have it be so. What can I say? I was bored and wandered in where I do not belong!